That's enough from me now. Make sure you join us tomorrow for Kilmarnock v Aberdeen and all of those vital games at the top end of the Championship. Thanks for your company and enjoy the rest of your Saturday. "It feels great. It wasn't a pretty game but the main thing was to get the three points. We're probably the first team to get into the top six scoring less than 30 goals, so we've had to be dogged along the way. It gives us a lift for the rest of the season because we can catch Dundee United and maybe get Europe, depending on who wins the cup." There is also a Premiership game on Sunday, with Aberdeen travelling to Rugby Park for a 12:15 kick-off. The Dons can cut Celtic's lead at the top to five points with a win in Ayrshire but Kilmarnock need to win to keep alive very faint hopes of reaching the top six. Tomorrow is a big, big day in the Championship, with Hibernian looking for a first Edinburgh derby win of the season at Easter Road before Rangers take on Raith Rovers at Ibrox and Falkirk go to Queen of the South. There are four sides going hammer and tongs for three play-off places, so something, or rather some team, has to give way. Livingston remain three points adrift at the bottom of the Championship after their win at Cowdenbeath since Alloa were also victorious but they are now just five points behind the Blue Brazil in eighth spot. We have a thrilling finish in store at the top of League One. Forfar beat Airdrie to go top by two points today, with Stranraer slipping to defeat at Dunfermline. Meanwhile, Morton are just three points off the number one position after staging a remarkable late comeback to beat Stenhousemuir 3-2 at Cappielow. "It gives us that cushion and we can relax a bit. It's a good position to be in. You could see once we got our first goal we got that momentum and started to really hurt Motherwell. That bodes well for the final five games." St Johnstone always enjoy a win against Tayside rivals Dundee and this one is extra sweet since it confirms their presence in the top half of the league for the fourth year running. It's not all bad for Dundee since they are almost certain to join them in the upper berth for the closing fixtures. Kilmarnock can still claim the last available but they would need to win their games against Aberdeen and Celtic and make up eight goals in the process. Never going to happen, is it? That was a big three points for Partick Thistle today as they move up to eighth in the Premiership. The first half was a nervous affair but the home side were re-energised after the break, with Lyle Taylor knocking in both of the goals. The Jags are now seven points clear of Motherwell in the relegation play-off spot. The Steelmen were looking for a fourth consecutive victory but posed very little threat after an early miss from John Sutton. Dundee United keeper Radoslaw Cierzniak had a howler in the midweek derby defeat but he was a hero today, making a string of good saves before Chris Erskine knocked in the winner to end a run of 10 games without a win for Jackie McNamara's side. It's been a miserable season for Stirling Albion in League One and their relegation is now confirmed. The Forthbank side have won just three of their 30 league matches. It really should be 2-0. Nadir Ciftci drives into the box, drills the ball across to Mario Bilate at the back post, but the substitute somehow stabs it past the post. In League One, Morton have hit back from 2-0 down to level at Cappielow and keep their title hopes alive, with Declan McManus on target. A bad day for Motherwell just got worse as Stuart Carswell is sent off after a heavy tackle on Ryan Stevenson. We're into the last five minutes or so across the country. Time for some late drama? It's all hustle and bustle in Perth, with very little in the way of goalmouth action. The Saints are on course for a fourth consecutive top-six finish. United striker Nadir Ciftci breaks free of the last defender and manages to block goalkeeper Michael McGovern's rushed clearance but the ball falls kindly for Accies to clear. Jordan White grabs a second goal as Livingston come from behind to take a 2-1 lead at Cowdenbeath. Can the West Lothian side pull off their own Great Escape in the Championship? All smiles from Lyle Taylor at Firhill. The Partick striker is chasing a hat-trick after knocking in two very welcome goals. If it stays the same, Thistle will move up to eighth, while Motherwell remain in the relegation play-off place. How about that goal at Tannadice? Hamilton fans must be tearing their hair out, with the visitors having created a host of good chances. The winless run is on course for 13 games now. Dundee United take the lead after leading a charmed life at the back. Radoslaw Cierzniak pulls off save after save to deny Accies, and then the home side race up the other end where Chris Erskine finds the space to drill the ball past Michael McGovern from 15 yards. Accies sub Jason Scotland is making a big impact since coming on, and Radoslaw Cierzniak has to turn his high effort round the post. Jackie McNamara's men are really toiling here. Bottom-of-the-Championship Livingston are level at Cowdenbeath, with Jordan White on target. Moments later, the visitors waste a good chance as Danny Mullen races through but cannot beat keeper Robbie Thompson. A huge two minutes for the home side who are somehow still level. First, Jason Scotland drives down the right, cuts the ball back for Darian MacKinnon who is incensed when his goal-bound shot hits the arm of a defender but no penalty is given. A minute later, Louis Longridge meets the ball from close range at the back post, but Radoslaw Cierzniak manages to keep it out. It's the same combination for the Jags as Callum Booth delivers the ball to the front post for Lyle Taylor. The striker gets a second bite at the cherry after his first effort is blocked and he rifles the ball into the net. A big chance for Lyle Taylor to double his tally at Firhill as Callum Booth picks him out in the penalty area but the striker can't beat keeper George Long with his shot. In League One, Jordon Brown is on target as Peterhead take the lead at Somerset Park. The visitors were 2-0 down to Ayr United early doors. Saints goalkeeper Alan Mannus gets in a muddle as he struggles with a cross from the right and palms Paul McGinn's delivery out from underneath the crossbar. Kallum Higginbotham's free kick to the back post is headed on by Conrad Balatoni and there is Lyle Taylor to nod it home from a yard or so out. The visitors are inches from taking the lead at Tannadice as Stephen Hendrie pokes the ball off the far post. It was practically in slow motion with an outstretched Radoslaw Cierzniak beaten, but it bounces away to safety. In the Championship, Cowdenbeath are in front against Livingston as Nat Wedderburn smashes the ball past Darren Jamieson for his first goal of the season. No signs of a turnaround in fortunes at Firhill as the ball is knocked straight out of play from the re-start. The action is back up and running... Some more goals, please. A funny moment just before the break at Tannadice as Radoslaw Cierzniak makes the save, attempts to get the ball thrown out quickly, and is instead tripped by Dougie Imrie, resulting in the Polish goalkeeper rolling around on the floor. An apology, a warning from the referee, and the half-time whistles ensures there is no retaliation. Dundee come very close to an equaliser as David Clarkson's volley from Paul McGowan's cross cannons off the post. Dundee are living dangerously at McDiarmid Park. Already a goal down, a slack pass by Willie Dyer almost lets Saints in but the visitors eventually scramble the ball clear. It's not pretty stuff at Tannadice, but as the ball ping pongs around Nadir Ciftci manages to get it under control, turns and fires in a low right foot shot, but Accies keeper Michael McGovern is equal to it. Queen's Park, hoping to profit from a slip from League two leaders Albion Rovers, are ahead at home to Annan Athletic thanks to Sean Burns. The Jags have picked up the pace in the last few minutes and this time it's Kallum Higginbotham flashing a dangerous cross into the area. mark j ferguson: "Well done Inverness. Hopefully they can go one better and knock Celtic out of the cup next week. #bbcscotfootball"
Partick Thistle forward Lyle Taylor does well to get the better of Stephen McManus and drills the ball across the six yard box, with Ryan Stevenson unable to get a touch in front of goal. League Two leaders Albion Rovers fall behind at East Fife, with Sean Dickson on target. The game livens up with a chances at either end. First, Blair Spittal weaves his way past two players and into the box. Ziggy Gordon gets the challenge in to deny him, hurting himself in the process. Then, Accies forward Nigel Hasselbaink sees a close-range shot cleared off the line, and then heads the rebound wide. Brian Graham capitalises on an error by Simon Ferry and what a finish, curling the ball past Scott Bain from the edge of the penalty area. Saints keeper Alan Mannus comes to the rescue for team-mate Simon Lappin after the latter's header goes erroneously towards goal. Stephen Pearson gets his head on a free-kick as Motherwell threaten again, with the ball sliding a few feet wide. Apart from a goal-kick, Accies 'keeper Michael McGovern is yet to touch the ball. Ali Crawford and Louis Longridge have half-efforts at the other end as, with the wind at their backs, the visitors continue to be the more threatening side. It looks like being a good home debut for new Alloa boss Danny Lennon since Kevin Cawley has thumped in a shot to make it 2-0 against Dumbarton. Andrew Jackson is on target for Brechin City against Stirling Albion. The Binos will be relegated from League One unless they win. Paul Paton is surrounded by angry Accies players who feel he's taken a dive as Darian Mackinnon is booked. Charlie Telfer takes the free-kick and fires it over. "I think both sides are a little bit nervous and they are finding it hard to get going, although Motherwell have probably started the better," says BBC Sportsound's Pat Bonner. The visitors have started the better of the two teams as Dougie Imrie tries a spectacular volley but can't connect properly. United don't look too confident at the back. Saints do some early pressing and captain Dave Mackay blasts in a shot that cannons off a defender. More pressure ensues but Dundee clear their lines. We have a goal in the Championship as Iain Flannigan gives Alloa an early lead at home to Dumbarton. Motherwell striker John Sutton is set up by Scott McDonald, who steals a poor pass-back from Abdul Osman, but the striker's shot clips a covering defender and go inches wide of the post. BBC Scotland's Jim Spence is chittering through his teeth as he tells us snow and sleet is driving across Tannadice. "We controlled play better in the second half but we were not quick enough on the ball so we could not create the chances we wanted. It was step down for us if you compare it to how we have played lately. We looked a little bit tired today." Inverness and Celtic meet again at Hampden next Sunday with a place in the Scottish Cup final at stake. John Hughes will want to see a repeat of the endeavour his side showed today but he said his team need to be braver on the ball under pressure. Inverness CT manager John Hughes tells BBC Radio Scotland listeners that Dean Brill dislocated his knee in the earlier 1-1 draw with Celtic. The goalkeeper, making his comeback from injury, was hurt while making a clearance early in the first half. St Johnstone: Mannus, Mackay, Wright, Anderson, Easton, Millar, Lappin, Wotherspoon, O'Halloran, Graham, MacLean. Subs: Scobbie, Swanson, Banks, McFadden, Miller, Brown, Kane. Dundee: Bain, Paul McGinn, Konrad, Davidson, Dyer, McAlister, Ferry, McGowan, Stephen McGinn, Stewart, Clarkson. Subs: Letheren, Black, Gadzhalov, Wighton, Colquhoun, Harris, Heffernan. And at McDiarmid Park, there's the small matter of a Tayside derby. The Perth side can cement their place in the top six with a win today but they have been stuttering on the final stretch after a draw at 10-man Hamilton and a midweek defeat at Ross County. Manager Tommy Wright has been chopping and changing his options up front lately but goals have been a problem all season, with only lowly St Mirren scoring fewer. Dundee moved into the top half of the table during the week with their first derby victory in more than a decade and Paul Hartley's side can leapfrog their hosts with another win today. On a run of three games without defeat, the Dark Blues are looking for a McDiarmid Park double, having won here in September thanks to a Thomas Konrad goal. Partick Thistle: Fox, O'Donnell, Frans, Balatoni, Booth, Higginbotham, Osman, Bannigan, Lawless, Stevenson, Taylor. Subs: Doolan, Gallacher, Richards-Everton, Fraser, Wilson, McDaid, Keenan. Motherwell: George Long, Law, Laing, McManus, Straker, Ainsworth, Lasley, Pearson, Erwin, McDonald, Sutton. Subs: Carswell, Ramsden, Twardzik, O'Brien, Kerr, Moore, Dominic Thomas. The Jags have had one eye over their shoulders in recent weeks as the teams below them have been eating up the ground, so this will be a real test of nerve. A third consecutive home win will lift Thistle up to eighth place but a fourth victory on the spin for the in-form visitors will leave the hosts just one point above the relegation play-off spot. Motherwell hammered five goals past St Mirren during the week and will be in great spirits, while Partick went down 2-0 at Celtic Park, their fate sealed after a red card for James Craigen moments before half-time. The Steelmen have hit the net 11 times in their three-game winning run, with the experienced Scott McDonald bringing out the best in young Lee Erwin. Dundee United: Cierzniak, McGowan, Souttar, Morris, Dixon, Connolly, Paton, Telfer, Erskine, Spittal, Ciftci. Subs: Dillon, Muirhead, Bilate, Butcher, Scott Smith, Szromnik, Anier. Hamilton: McGovern, Gordon, Devlin, Lyon, Hendrie, Longridge, Gillespie, MacKinnon, Imrie, Hasselbaink, Crawford. Subs: Scotland, MacDonald, Watson, Brophy, Redmond, Hill, Tagliapietra. Both of these sides are crying out for a win following dreadful slumps in form. The home side have gone 10 games without a win, while the visitors have finally dropped out of the top six having gone 12 matches without success. United were well beaten in the midweek derby having enjoyed dominance in that fixture for so long. Accies player-boss Martin Canning, suspended today, lost his first match in charge against United on 12 January and is yet to know the winning feeling since taking over from Alex Neil. Celtic are now eight points clear of Aberdeen, who visit Kilmarnock tomorrow lunchtime. Can we say the title race is back on? Why not? The Highlanders' run of games without a win stretches to seven but I'm sure manager John Hughes will be very pleased with a point against the Premiership leaders. The match began explosively, with Leigh Griffiths and Edward Ofere exchanging goals inside four minutes, but the rest of the game was scruffy, punctuated with fouls, while a strong wind also made life difficult for the players. Celtic midfielder Stuart Armstrong finds room for a shot on the edge of the penalty area but his low effort is scooped up by Ryan Esson without too much fuss. We're into stoppage time now - an extra two minutes has been added. Kris Commons has another go but this time the shot from distance flies high over the target. For all of Celtic's possession, they have seldom threatened goalkeeper Ryan Esson since he came off the bench in the first half. Aaron Doran and James Vincent come on to play the last five minutes or so for the hosts. Ryan Christie and Danny Williams make way. A neat passing move from Inverness ends with the ball dropping to Greg Tansey on the edge of the penalty area but he takes a fraction too long to get the ball from under his feet and Jason Denayer is able to get his outstretched studs in the way as the shot is deflected over. Kris Commons has two attempts on goal in quick succession, his first effort is blocked by a Celtic team-mate on the edge of the box, the second drifts over. We're into the 80th minute now. Will we get a late winner? A final change for Celtic, with early goalscorer Leigh Griffiths replaced by John Guidetti. Lots of head shaking from the man going off but he's been quiet since that fine strike on three minutes. Inverness string a few passes together and win a corner on left. Greg Tansey's delivery is cleared as far as David Raven on the right edge of the box and the full-back has a blast, with his rising shot clearing the crossbar by a yard or so. Celtic definitely have the momentum here as Inverness struggle to get out of their own half. Forwards Ryan Christie and Edward Ofere are working hard to help their team-mates but in doing so are seldom open for a pass upfield. Ross Draper, already booked, is walking a fine line as he slides in late on Stefan Johansen to give away a free kick near the Inverness penalty area. Virgil van Dijk has a shot from 22 yards but it comes bouncing off a brave head in the defensive wall. Yet another booking but there's no foul here. Instead, Celtic skipper Scott Brown is penalised for a hopeful dive in the box as he brushes past David Raven. To take part in today's coverage, you can text 80295, tweet using the hashtag #bbcscotfootball or leave comments at the BBC Sport Scotland Facebook page. Facebook: "11 fouls and 4 bookings for ICT, 13 fouls and 2 bookings for Celtic. When are referees going to give us a level playing field when Celtic are the opposition?" John Robertson on Facebook: "Hopefully caley can sneak the points, open the door a wee bit for the dons tomorrow maybe?" Gary Mackay-Steven and Efe Ambrose are the players exiting as Celtic make that double change. Activity on the Celtic bench as Kris Commons and Adam Matthews look ready to come on. Stuart Armstrong sweeps in a free-kick from deep and Jason Denayer is able to keep his header on target but Inverness goalkeeper Ryan Esson is equal to it, pushing the ball over for a corner. Greg Tansey whips in a useful corner but Josh Meekings cannot steer his header on target in a congested penalty box. Greg Tansey delivers an inviting, diagonal ball to the back post area where Marley Watkins rises but is beaten to the ball by covering Celtic defender Emilio Izaguirre. Now Ryan Christie is on the turf clutching his heel and Celtic's Stuart Armstrong is booked for the challenge. Celtic get the action started again in the Highlands. Within seconds, Marley Watkins is taken out with a clothesline wrestling move from Nir Bitton. Surprisingly, the booking count is not added to. Albion Rovers, away at East Fife, enjoy a healthy eight-point lead, while stragglers Montrose, at East Stirlingshire today, look destined to take part in the first play-off with either Brora Rangers, the Highland League champions or Edinburgh City - top dogs in the Lowland League. Stirling Albion will be relegated if they fail to beat Brechin City, or if Ayr United and Stenhousemuir both win. 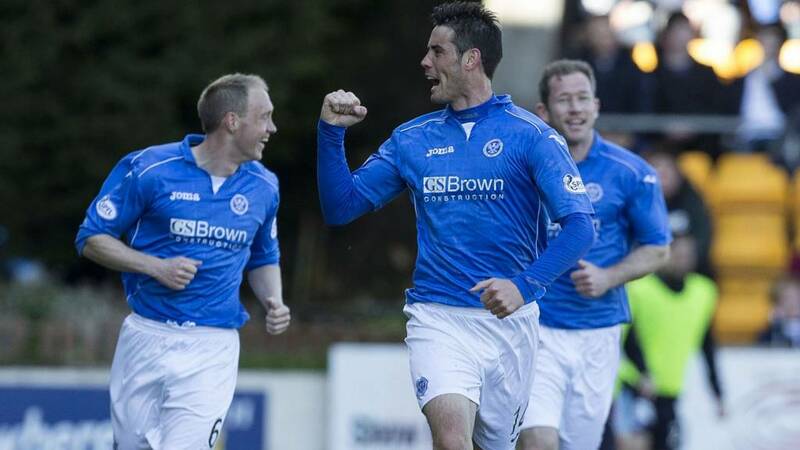 Stranraer, away to Dunfermline, lead the way by just one point from Forfar. It's a quiet day in the second tier, with only the bottom four clubs involved. Alloa, at home to Dumbarton, and Livingston, who travel to Cowdenbeath, could really do with wins if they are to have any hope of catching up. Buoyed by their Challenge Cup triumph, Livi surprised Falkirk in midweek but the Blue Brazil have found form too and are also going for a hat-trick of victories. MBEHAN: "Remind me what Ambrose offers at right back , Celtic badly missing Commons #bbcscotfootball"
Ross on Facebook: "Don't know how Ambrose is still in this Celtic team, he's the opposition's best player almost every week!" David Mowat on Facebook: "Fancy ICT could get a point here and not sure if it will end with 22 players on the park!" Spare a thought for Dean Brill, who was carried off on a stretcher early in the game. The Inverness goalkeeper was making his return from injury having been out since 24 January but damaged his knee when clearing under pressure from Gary Mackay-Steven. Well, we had a thrilling opening four minutes, with Leigh Griffiths and Edward Ofere exchanging goals but it's all been a bit scrappy since then. Inverness are pressing hard all over the park but a few challenges have been too feisty and they have four players going into the interval on bookings. Celtic have a free kick in a central position as Scott Brown is bundled off the ball. Leigh Griffiths steps up and curls an effort high over the crossbar from 25 yards. The caution count is rising as referee Craig Thomson flashes yellow at Marley Watkins for a sliding hack at Emilio Izaguirre. That's four bookings for the home side now. We're getting four minutes of stoppage time before the break due to that injury to ICT goalkeeper Dean Brill. With half-time approaching, Celtic are beginning to monopolise the ball and the home side are sitting deeper. Stuart Armstrong floats in a free-kick from the right and Efe Ambrose towers above the pack to get his head on it. However, he can only steer the ball straight at Ryan Esson and the keeper is able to tip it over. Gary Mackay-Steven has his shirt tugged as he bids to skip past Ross Draper and the Inverness midfielder is the latest player to be booked. But Edward Ofere levelled the game 90 seconds later. Andrew Priestley: "Celtic's defence has been very poor at times this year. If they want to progress in Europe next season they must strengthen." The niggle continues as Inverness playmaker Ryan Christie is taken out by Virgil van Dijk following a neat passage of passing from the home side. A booking for the Celtic defender. Celtic captain Scott Brown cuts inside from the left to have a pop at goal and his bobbling shot is gathered by Ryan Esson after an initial fumble. Edward Ofere lifts his head 30 yards out and thinks about a shot from distance only to have the ball taken off his toes by Scott Brown. The Inverness goalscorer is then shown a yellow card for a hack at the same opponent near the halfway line. There are a few meaty challenges going in, with Celtic skipper Scott Brown and Ross Draper having a good old ding dong in the middle of the park. Celtic midfielder Stefan Johnasen pops up on the left edge of the penalty area and his low shot is comfortably gathered by Ryan Esson at his near post. Dean Brill gets a warm round of applause as he is carried off the park. The goalkeeper appears to be in some distress, with his hand over his face. On second viewing of the incident that led to Dean Brill's injury, it looks like the keeper may have caught his standing leg on the turf and has nothing to do with the challenge from Gary Mackay-Steven. He certainly signalled for assistance as soon as he hit the deck. Inverness are forced into an early change between the sticks as Dean Brill is being prepared for a stretcher. Ryan Esson is ready to come on. Dean Brill, making his first start since January, is in some pain as he is caught by Gary Mackay-Steven when making a clearance. This is a worry for the home goalkeeper. With the wind swirling in off the Moray Firth, both sides are trying to keep the ball on the deck and there is a good pace to the game. Stephen Hay: "I didn't expect to have the correct score after 4 minutes. First to score 5? #bbcscotfootball"
That's just the eighth goal Celtic have conceded on the road in the league this term. The hosts respond immediately as David Raven skids in a low cross for Ryan Christie to connect with on the six yard box. Jason Deanayer makes a good goal-line clearance but Edward Ofere is in the right place to tap in. Celtic are ahead as Scott Brown plays a long diagonal over the top of the home defence and Leigh Griffiths is on it in a flash, striding forward and drilling a fabulous low strike into the bottom corner. Space opens up for Edward Ofere just inside Celtic territory but the big Inverness striker doesn't have the legs to get away from Virgil van Dijk. Inverness get the game started, with the Highland capital bathed in sunshine, although it's a bit nippier than it has been over the last couple of days. "We lost here last time, so we know it's going to be tough. "We want aggressive pressure and to switch the ball with tempo. I'm happy with the performances we have had but I want to score more goals. We can get better at finishing our chances." It looks like poor old St Mirren are destined for the drop but the jostling to avoid 11th place and the relegation play-off is really heating up. Motherwell currently occupy second-bottom spot but they will visit Firhill buoyed by a hat-trick of wins on the bounce. A fourth consecutive success will see them close to within a point of Partick Thistle in ninth. In November, John Guidetti scored the only goal to give Celtic victory over the Highlanders in Glasgow. The big Swede played a key part in both of Celtic's goals in the midweek win over Partick Thistle but loses his place up front to Leigh Griffiths today. Colin Smart on Facebook: "I'm going for 2-0 to the Hoops today!" "We know how difficult it's going to be. Celtic at their best, can beat anybody in Scotland, so we have to hope they have an off day and we'll need to be at our best. "This is probably a freebie - we can go and express ourselves and have a real go to send out a message for next week. "We know they will have a lot of the ball so we need to keep our shape and discipline. "But we'll press them hard and I've gone 4-4-2 to keep it positive." It was on this ground that Ronny Deila suffered his first domestic defeat as Celtic manager. The unfortunate Eoghan O'Connell scored an own goal to give Inverness a 1-0 win in August. This one is a dress rehearsal for next weekend's Scottish Cup semi-final, with the teams due to meet again at Hampden next Sunday. Inverness CT: Brill, Raven, Shinnie, Warren, Meekings, Draper, Tansey, Williams, Christie, Watkins, Ofere. Subs: Esson, Vincent, Doran, Ross, Devine, Tremarco, Kink. Celtic: Gordon; Ambrose, Denayer, van Dijk, Izaguirre; Brown, Bitton; Mackay-Steven, Johansen, Armstrong; Griffiths. Subs: Zaluska, Matthews, Guidetti, Stokes, Commons, McGregor, Tierney. Inverness Caley Thistle have gone six league games without a win but have still managed to strengthen their grip on third place due to the faltering form of those below them. Goals have been hard to come by for John Hughes's side of late, with only one scored in the last three games. We're approaching the business end of the season and Celtic appear to be cruising towards a fourth consecutive title. Ronny Deila's team enjoy a seven-point lead at the top, with a game in hand over nearest challengers Aberdeen. The defending champions are in Inverness for today's early kick-off and arrive on the back of five straight victories and five clean sheets. Good afternoon and welcome to Saturday's live Scottish football coverage.